At home, we often come across a number of flying insects including flies, mosquitoes, wasps and hornets. If they’re an issue at home, an effective insect killer can be quite an investment. Provided that you make the right choice. The Hoont Electronic Indoor Bug Zapper is a safe buy, especially, if you’re tired of running behind gnats and fruit flies with an electric fly swatter, or punching up Google for new and innovative DIYs of killing mosquitoes. For an indoor bug zapper, hygiene is something you can never compromise at whatever cost. For instance, how do you get rid of the dead insects, does it release nay odors etc. If you’re in the middle of making a purchase but don’t know where to begin, you’ve come to the right place. Uses two 10-watt (total 20-watts) ultraviolet bulbs that attract pesky flying insects. Features a detachable chain to keep children and pets, but can be free standing as well. Dead insects get collected at the tray bottom for safe removal and disposal. Large area of coverage, up to 6,000sq. feet. In addition to the hygiene features, the device comes with a safe design since the first thing that comes to mind when buying such a powerful repeller is the safety issue. This concern is compounded if you have young children and/or pets roaming freely across the property. The Hoont Bug Zapper uses 20 watts to kills insects up to 6,000 Sq. Ft., which is quite impressive. It features two high-intensity 10 watt ultraviolet bulbs that attracts all pesky flying insects into the device. Insects then make contact with an extremely powerful high voltage electrically charged metal grid, instantly killing them. You have no limit of insects that it can blast. Designed to spread light in all four directions, this zapper covers a large area of up to 6,000 sq. feet. This makes it a recommendable choice for home, office, kitchens, restaurants, schools, hospitals, and can also be used commercially or even in industries. It main features are a detachable chain, designed for wall mounting to keep out-of-reach of children and pets, or can be free standing. Dead insects get collected at the tray at bottom of unit, which can then be easily removed for cleaning and bug disposal. It is safe to operate, with an electric-grid that prevents clogging. This unit is pesticide, chemical and odor free but also very effective at zapping bugs. You can hear sparkles when bugs hit it. It has a UV light style lights or 2 beams very mild nothing to distract you from what you are doing. Non clogging and easy to clean out the dead bugs. Kills more insects than most counter products. Some people won’t stand the Zapping noise when the insects are being killed as much as the noise is not much. 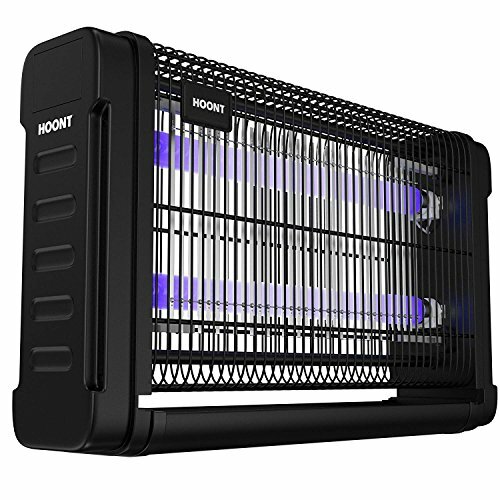 The Hoont Electronic Indoor Bug Zapper is a well-designed, effective insect killer that uses 20-Watt blasts over a distance of 6,000 Sq. Ft. We particularly found the ability to kill insects unselectively as a big plus, since you can kill mosquitoes and any other bugs that would otherwise be hard to contain at home. There is a tray at the bottom of the device, so whenever any insect would be kill, it will simply collect over the tray. All these, added to the nice choice make it a recommendable choice for home, office, hotel use. The Hoont Electronic Indoor Bug Zapper comes handy, especially, if you’re tired of running behind gnats and fruit flies with an electric fly swatter, or punching up Google for new and innovative DIYs of killing mosquitoes.